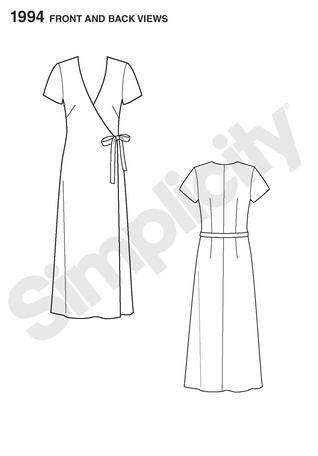 I love wrap dresses and contemplated working up another dress from my rtw template, however, before working up another one I wanted to trace & modify the pieces on tracing paper. The modification would've been to make the front bodice and skirt into one piece, as well as the back. Luckily, I didn't have to recreate the wheel, while in walmart came across Simplicity 1994 which consist of a full front & back. 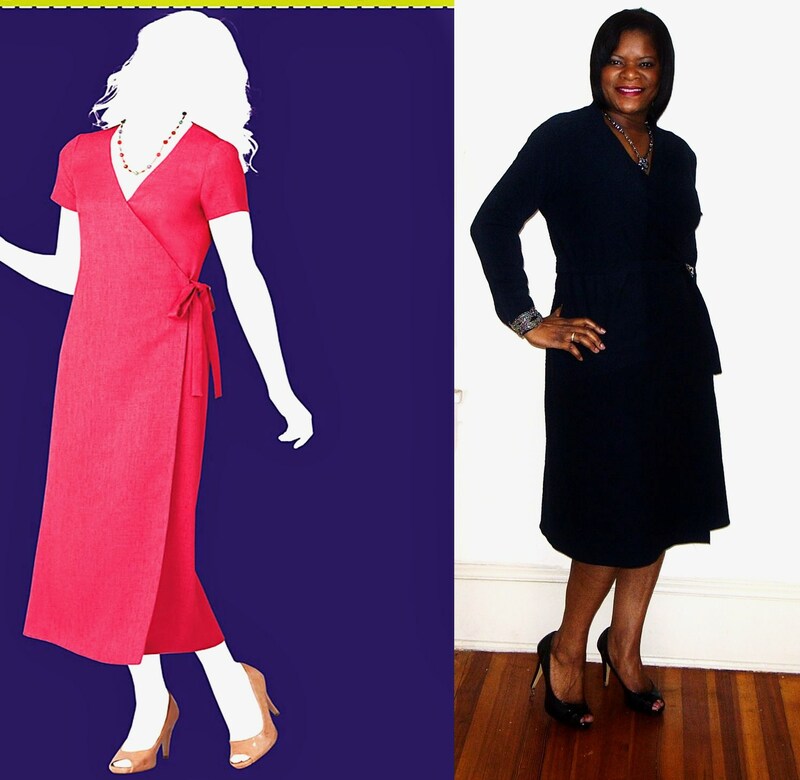 I used a textured cotton-synthetic blend knit with one-way stretch in navy blue, although the fabric options are soft cottons, silky types, lightweight linen. I did a lil modifying of the pattern, for the neckline I cut a 10 and graded out to a 14 , cut a 10 for the sleeves & lenghtened. 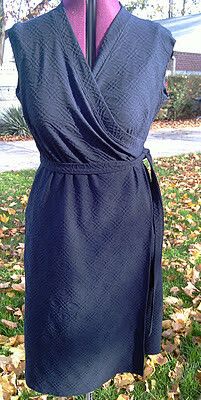 I wanted to wear this dress with boots that I've had for a few years, but rarely worn. The boots do not pair well with my other dresses that are mid-knee length or shorter. The boots have a wide opening and I really don't like when my boots are swimming wide below my knees. The dress original length was too long and removed 9" from it. Since I was using a knit with one-way stretch, I opted out of the front & back facing, instead made a long self-fabric bias trim. 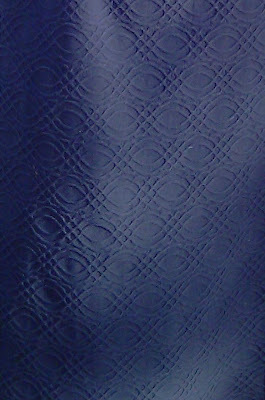 Used the tie pattern piece to make the fabric trim by cutting 4 of them about 30" long and with wrong sides together sewed the fabric trim into a long bias trim. Folded the trim in half and starting from the center back seam pinned and stretched the trim only as I pinned to the neckline to avoid any gapping. The illustration on the pattern envelope only shows the ties on the side, wherein my ties are super long and wrapped around my torso and pinned a brooch at the knot of the ties. The pattern instruct to press under 5/8" along the seam line of the right side of the back & front to create an opening for the tie. I opted to make a buttonhole 1/4"" away from the marked area for the opening instead. As for the instructions, I reviewed them initially, but thereafter opted to use the same techniques used for making my previous wrap dresses. 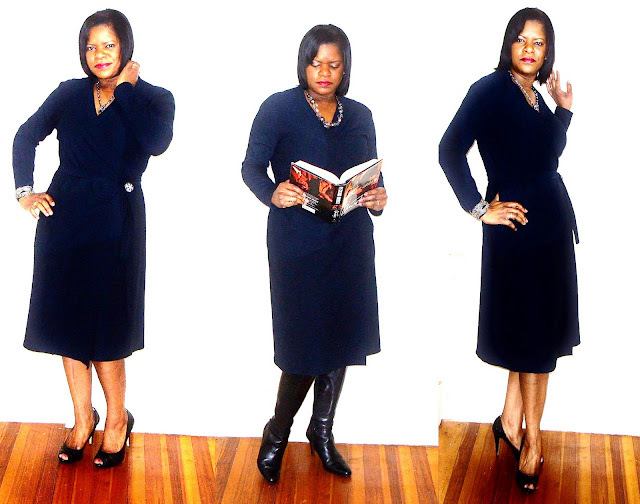 The dress is quick and easy and was a nice gratification for a friday nite. Oh, my! I like instant gratification. I will have to add this to my wish list. This pattern keeps calling out to me, and your version is really cute. I like instant, or almost instant, gratification. Sheila, you've done it again! This is very cute and elegant at the same time. You've inspired me to make one of these! Nice work! Great dress! again! You always amaze me! You know your style so well and this dress is a perfect example of a well thought out, well made dress that screams Sheila. Awesome dress! Very pretty dress, looks fantastic on you. That is one captivating dress, Sheila! Very nice neckline finish! Thank you for inspiring me to try this pattern. I like it, I like it. I'm dying to make another version of my favorite wrap dress. Hope it'll look as good as your does. Wow! You look great! I really like your version of the dress! Great fabric - and your version looks way better than the one on the envelope!! Yes, another cute dress. 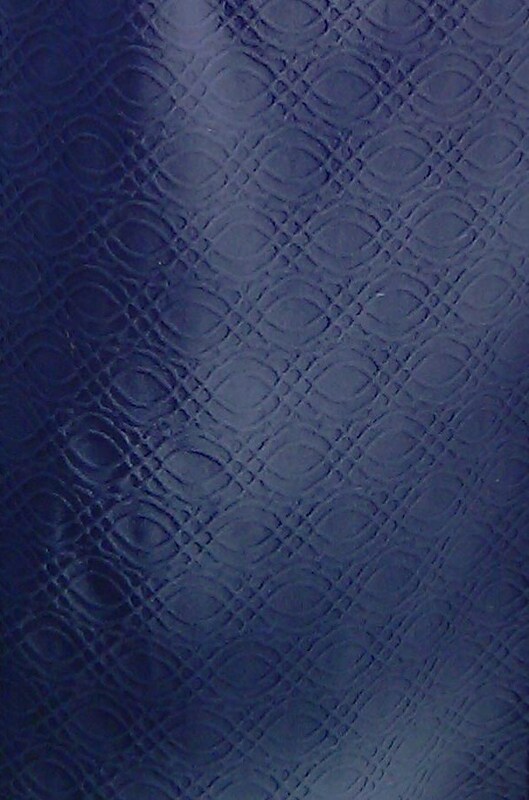 I really like the fabric. How cool. You look great. Wow,nice dress. Looking at yours makes me wanna try that pattern, I currently have 1993 which I plan to fit next for my 7 piece challenge. You can dress it up or dress it down. Beautiful. Sheila Baby! This is AWESOME!!! Loving it!! !